When you are having Christmas Day dinner at your godmother’s, and she asks you to bring “a vegetable for 16”, you kind of freak out. At least I do. I decided on roasted Brussels sprouts because it’s a vegetable I’ve learned to enjoy as an adult. I added a some lucious fatty/salty bacon and a bit of sweet to make it a festive dish. Preheat oven to 400°F. Line 2 rimmed baking pans with parchment paper. Toss sprouts with olive oil and sprinkle generously with salt and pepper. Divide between the 2 baking pans. Bake for 20-25 minutes, rotating and swapping the position of the pans halfway through cooking. 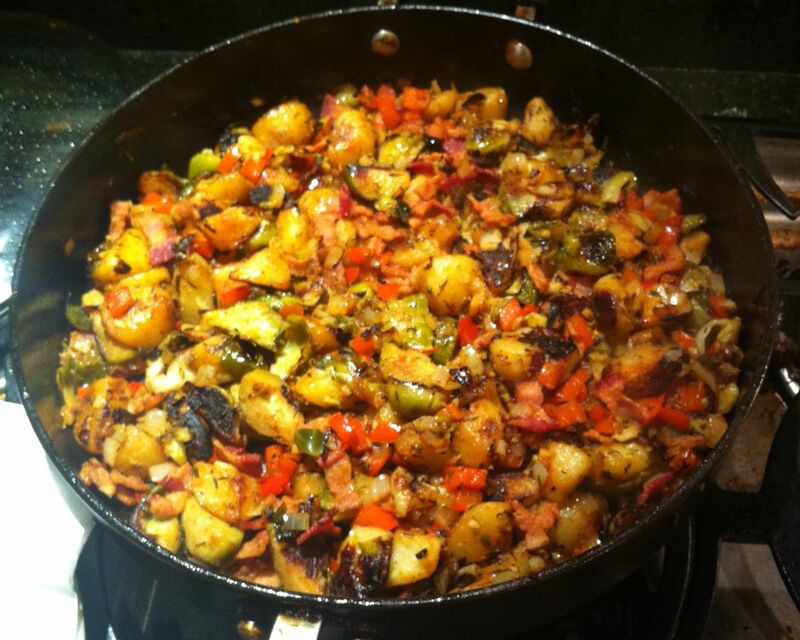 While the sprouts cook add the bacon and 1 cup of water to a non-stick skillet. Heat over medium heat until simmering. Cook for 5 minutes. Drain off any excess liquid/fat and crisp up the bacon to your desired doneness. The sprouts are ready when they can be easily pierced with a fork. Toss the sprouts, bacon and cranberries together. Transfer to a warmed serving dish and serve. This reheats well, either in a low oven or in the microwave. Our go-to cooking method for Brussels sprouts is to roast them. A couple of the cooking shows I watched over the last month though did a cooktop preparation of shredded sprouts. I was low on oven space one Saturday night and thought it was worth a try. Trim the bottom of your Brussels sprouts, removing any excess stem. Don’t worry if a leaf or two fall off. Fit a food processor with the slicing disk. Fill the feed tube of the processor with whole sprouts and processor. Repeat until you’ve shredded the lot. I had to empty the processor once due to the amount of sprouts I was cooking. Heat butter and olive oil in a dutch oven over medium heat until bubbly. Add the shredded sprouts, salt and pepper to the pot. Toss everything together in the pot and ignore for 4 minutes. Give the sprouts another good toss and once again ignore for 4 minutes. Toss once again and then taste. The sprouts should be tender; if not give them another minute or two. When cooked to your liking remove from the heat, add the balsamic vinegar and toss until well distributed. This recipe can easily be halved. I basically doubled the quantities in recipes I found to come up with this. Recipes consulted include this one from Alton Brown, one from epicurious.com, and one from Ina Garten.